New book suggests US Pres. Trump is unfit for his job, dumb. US President Donald Trump's lawyer may sue former White House strategist Stephen Bannon, as well as "Fire and Fury" author Michael Wolff. 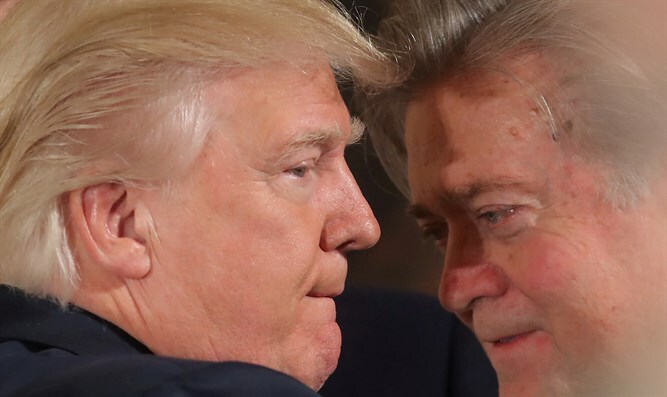 The suit against Bannon would be for breaking a confidentiality and non-disparagement agreement he had signed with the Trump campaign, while the suit against Wolff would be for libel and defamation. In a statement, attorney Charles Harder said, "This law firm represents President Donald J. Trump and Donald J. Trump for President, Inc. On behalf of our clients, legal notice was issued today to Stephen K. Bannon, that his actions of communicating with author Michael Wolff regarding an upcoming book give rise to numerous legal claims including defamation by libel and slander, and breach of his written confidentiality and non-disparagement agreement with our clients. Legal action is imminent." Among other things, "Fire and Fury" claims that "most White House aides and even family members doubt the 71-year-old’s capacity for the job." It also claimed that "for [the treasury secretary] Steve Mnuchin and [the former chief of staff] Reince Priebus he was an 'idiot.' For [the economic adviser] Gary Cohn, he was 'dumb as sh**.' For [national security adviser] HR McMaster, he was a 'dope.' The list went on." Meanwhile, Trump himself tweeted on Friday, "I authorized Zero access to White House (actually turned him down many times) for author of phony book! I never spoke to him for book. Full of lies, misrepresentations and sources that don’t exist. Look at this guy’s past and watch what happens to him and Sloppy Steve!" On Saturday, he wrote, "Michael Wolff is a total loser who made up stories in order to sell this really boring and untruthful book. He used Sloppy Steve Bannon, who cried when he got fired and begged for his job. Now Sloppy Steve has been dumped like a dog by almost everyone. Too bad!" A few hours later, Trump explained his view of the situation: "Now that Russian collusion, after one year of intense study, has proven to be a total hoax on the American public, the Democrats and their lapdogs, the Fake News Mainstream Media, are taking out the old Ronald Reagan playbook and screaming mental stability and intelligence." "Actually, throughout my life, my two greatest assets have been mental stability and being, like, really smart. Crooked Hillary Clinton also played these cards very hard and, as everyone knows, went down in flames. I went from VERY successful businessman, to top T.V. Star to President of the United States (on my first try). I think that would qualify as not smart, but genius....and a very stable genius at that!" On Friday, the US government announced that it would no longer allow personal electronics, including cellular phones, into the White House's western wing.